Most microcontrollers store the program they run in ROM, most of the time this ROM takes the form of a Mask ROM. This means that its set at the factory when the die is being made, one layer (or more) of the die contains the ROM and the program is hardcoded into the device. Development versions almost always exist that allow programs to be developed before the mass produced Mask ROM chip, but still the mask must be tested. The NEC 78k family was and continues to be very popular. Its current version (the RL78) is made by Renesas, which was formed when Mitsubishi, Hitachi, and NEC joined their semiconductor businesses. 78K processors powered everything from word processors to washing machines and sewing machines. Now they are also commonly found in automotive applications. Like many modern microcontroller families the NEC 78k traces its lineage back to the 1970’s. The family first appeared in 1980 as the uPD7801. 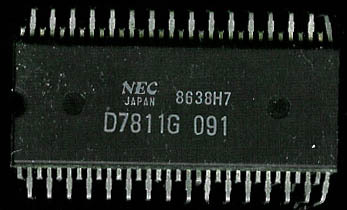 The 7801 was a microcomputer based on the NEC 780 which was NEC’s version of the Zilog Z80. The 781x series released in 1982 expanded on the architecture by including an ADC, as well as a full 16-bit ALU (versus the 8-bit from the 780 and 780x) that even supported 16-bit multiply and divide. 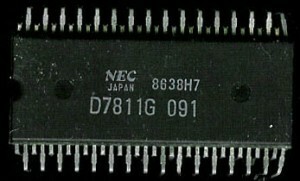 The 16-bit ALU made it a simple task for NEC to again extend the architecture to a 16-bit version. The instruction set was similar, though the naming was different then the Z80. 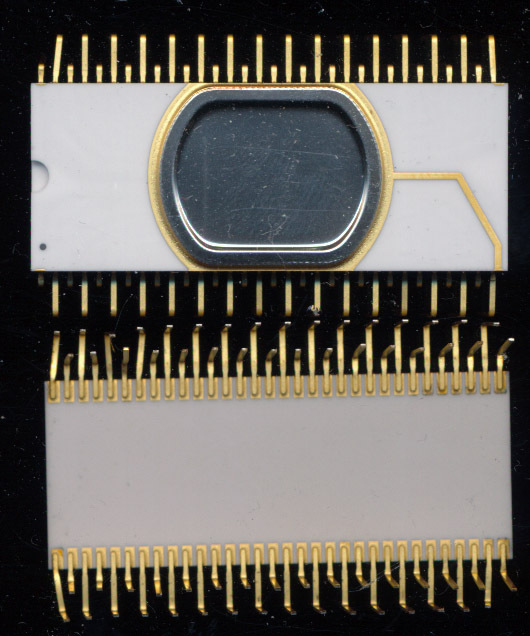 In 1985 NEC moved the 78k line to a CMOS process, reducing power requirements and increasing the max clock from 12 to 15MHz. The inclusion of many peripherals made the 78k a popular choice for many embedded applications. Its continued availability, and wide code base have allowed it to continue to thrive. And once again, a ‘modern’ MCU is based on a design from the 1970’s. Processor architectures rarely die, they just continue morphing. In 2003 Renesas Technology was formed as a joint company between Hitachi and Mitsubishi, combining their semiconductor operations. In 2010 Renesas Electronics was created by the merger of NEC Electronics, and Renesas Technology. This created the largest supplier of microcontrollers in the world, combining the product portfolios of NEC, Mitsubishi and Hitachi. This allowed them to stop competing amongst themselves, and compete with Samsung, Infineon and other suppliers. RX Series – a replacement for the Hitachi H8SX and Mitsubishi R32C designs. One of the largest markets for these microcontrollers (and associated other parts) is the automotive industry, with today’s vehicles containing, on average, $350 in just IC’s per car. $350 may not sound like much when a car costs $20,000, but the Average Sale Price (ASP) per component, is 33 cents, meaning there are, on average, over 1000 IC’s in a modern car, of which 50-100 are microcontrollers. They do everything from run the stereo, to monitor and adjust engine parameters. As more features (entertainment, navigation, stability control, etc) are added, the count goes up. The market downturn in 2008-2009 hit the automotive industry, and is suppliers very hard. With very small profit margins this hit Renesas very hard as well. Combined with increasing competition from Samsung Renesas has been driven into high levels of debt, and a distinct lack of profitability. 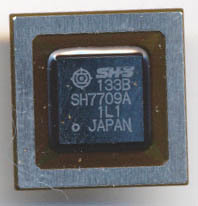 The SuperH line of microcontrollers (really full up processors now) was originally developed by Hitachi. They have found wide use in applications spanning printer controllers to automobile control systems. Renesas just announced yet another member of the SuperH family. 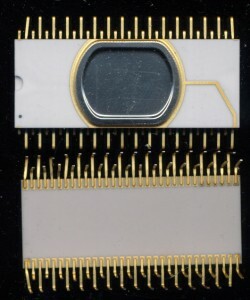 The SH7264 and SH7262 both include the now common SH-2A RISC core running at 144MHz as well as a FPU, but now integrate up to 1Mbyte of SRAM on die as well as many video functions. These chips can now drive displays without the need of external RAM, saving cost, and board space. Expect to see them in such things as car navigation systems, copy machines and the like. Automotive computing in manyways is similar to your personal computer, and the same inherent problems. On your PC it is good to have the OS isolated from the normal applications (especially the internet browser). Same thing in your car, you do not want the navigation and media player functions to be able to interfere or crash the control computer. This is why most cars have DOZENS of computers. 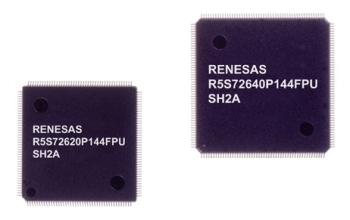 Renesas has just announced the SH7776, a dual SH-4A cored CPU. One core for the information systems, and one for the control systems. They share a common memory set, but it is segmented to prevent any problems. Each core runs at a whopping 533MHz and can output almost 2000 MIPS. Clearly thats not enough for Renesas, they through in a graphics core too, a PowerVR core with 3D Rendering.